One of the very first ‘classics’ that touched my heart was The Picture of Dorian Gray. Finding out that Creatures of Will and Temper was an interpretation of the story I loved, made me adamant on tracking it down. And once I did, it was magical – everything I ever hoped for and more. There was always something about Dorian that drew me to him. This was the first classic I read where I could empathize so clearly with our main character. It wasn’t Pride and Prejudice or Wuthering Heights or even Jane Eyre, but my dearest friend Dorian. What I loved about him was a vulnerability, his tragic journey, and his own ending. Tanzer uses the skeletal backbone of The Picture of Dorian Gray and imagines it in not only a diverse way, but in a way that brings in my favorite elements – supernatural, heroines, and sisters – without taking from the core of the book: vulnerability, dangerous love, and our pursuit of self. It is imagination at its best and I couldn’t love it more. Tanzer’s own author’s note puts her mission into focus – the desire to imagine our tragic story without victims, as a pure pursuit of aesthetic experiences, and the attempt to illustrate the messiness of life and our decisions. There was always an eeriness in The Picture of Dorian Gray, a hint of otherworldlyness, a glimmer of something in the corner of your eye. Tanzer embraces this aspect and evolves it into a full fledged supernatural aspect: demons. She does so in a way that seems effortless.There’s an ominous presence within the words, like the pulsing of blood underneath our skin, that creatures this current of suspense. Full of amazing characters, Tanzer takes our hero and turns him into a heroine – Doriana. But while this features alternating chapters of Doriana, my favorite character became her sister, Evadne. Doriana’s journey is a dance between demons and society’s expectations and with her own sister. Their lives and struggles to find themselves, intertwine like snakes, in an unconscious way, until the ending events are put into motion and you can trace back the ways in which their lives danced with each other. I adored Doriana’s spirit, her passion, and her ability to defy conventions. At the same time, I fell in love with Evadne’s resolve, her spirit, and her fumbling journey through prejudice. These two sisters are intricate, dynamic, and show real character growth as individuals and as sisters. They are refreshing and genuine, as prideful as they are vulnerable, and as strong as they are wounded. I saw myself in Doriana’s passions and Evadne’s discipline. I wished I could be as carefree as Doriana and as accepting as Evadne. Among other things I adore in this book, there is a lesbian relationship, a relationship of prejudice, and one of bravery. Tanzer feints and twists our heart the entire book, making us love and hate characters, expect downfalls, and trick us into a false sense of security. By the end, I was caught up in this tornado of feelings, bravery, and emotion. We are whipped into a frenzy, spun around, and pushed off into the deep end – in an entirely good way, until the book has ended and we aren’t sure where the time has gone. 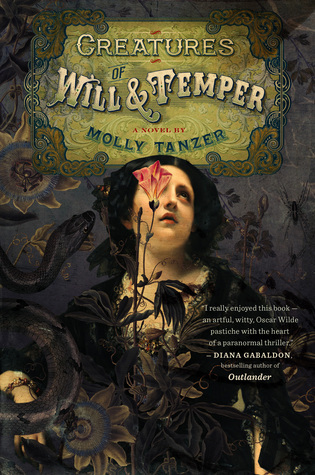 If you at all loved The Picture of Dorian Gray and want to see an interpretation do justice to the beauty within those pages, while bringing it to life in a new way, Creatures of Will and Temper has to be your next read. You can find Creatures of Will and Temper on Amazon(US), your local indie, and add it to Goodreads. Disclaimer: I received this book in exchange for an honest review from Netgalley.